A free way to track sharing or your money back. One of the common choruses we heard from our users was they wanted to access the share message that pops up when site visitors hit the share button. They wanted to control the copy and image. So, we built Auto-Import for social sharing. 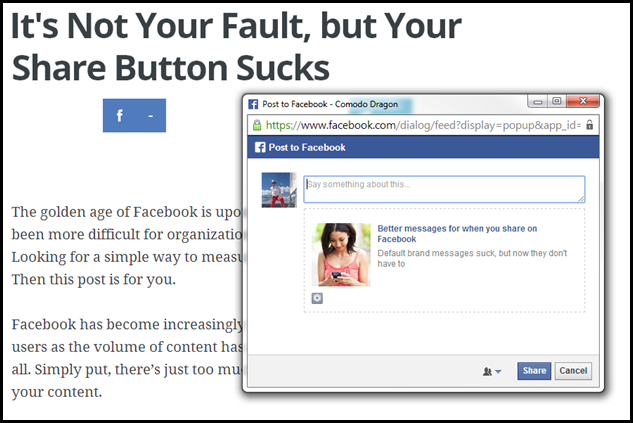 As the name suggests, Auto-Import collects the content generated when people use Facebook Share and Tweet buttons. That messaging is transported into the Naytev dashboards giving you a window into how your users share your content. It allows you to watch how an article or blog post is being shared and the amount of referral clicks generated from the piece. From the moment a site visitor clicks the share button to the point of others joining in on the fun, Auto-Import captures it all. The analytics are action-based so our dashboards can show you how far your site visitors get in the act of sharing. We capture if they click the share button but decide not to post anything; we call this a ‘Bail’. We capture how effective the share was, what traffic comes from it, but best of all, we allow you, the content producer, to convert it into an experiment. Remember, Naytev experiments allow you to optimize the share message. You can create experiments to test and change the picture and title of what people are sharing. The right message means more site traffic. As Sara Critchfield from Upworthy noted, “If 11 words is the difference between 14 million more people seeing your content, isn’t it worth spending more time on it?”. Well, with Auto-Import you can tailor the existing share message however you see fit, use it as one of your message versions, making it faster and easier to run Naytev experiments. What’s more, you can compare how the original share text fares against the versions you create in your Naytev experiments. Let it serve as the control to see how much referral traffic you’re getting from your tweaks. And thanks to our high-powered machine learning algorithms, our system will measure and push the best version forward. Every. Single. Time. It removes the guesswork AND provides insights into how visitors are interacting with your site. You can start experimenting today. If you’re a user, you’ll see Auto-Import on the left side toolbar. If you’re not a user of Naytev yet, simply sign up and you can create your first experiment. And if you click the share message at the top, you’ll notice we’re doing it already.